It would be a mistake to boil down an entire continent to one singular design scheme, and yet, there are certain elements that seem to unite European style we keep coming back to. Old-school (and we mean circa-1800) architecture coupled with bright, contemporary elements makes for a juxtaposition that’s both fresh and nostalgic. The kitchen, in particular, is a great example of this. Generally the heart of most European homes—honestly, we’d spend all our time in the kitchen as well if it produced fresh tortellini—the kitchen is never an afterthought. 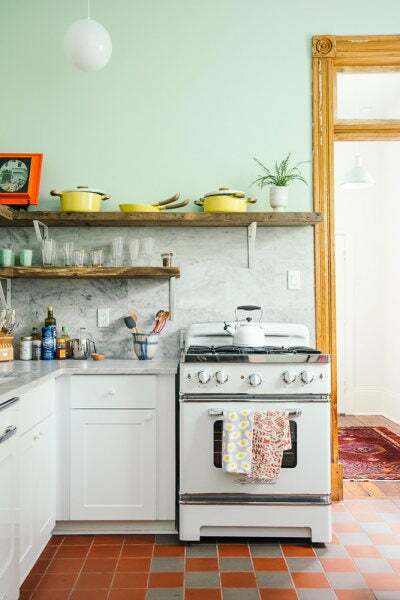 And if you’re getting tired of the whitewashed kitchen trend that seems to still be monopolizing the U.S. market, looking abroad for inspiration is a great idea. To determine the European kitchen trends slated to be everywhere this year, we turned to the experts. Laura Calimano, product designer and trend analyst for Spain-based kitchen surface manufacturer Cosentino, and Valentina Bertazzoni, head of style and brand for Italian kitchen appliance brand Bertazzoni, are at the forefront of European design. On recent trips to their factories in Almeria and Parma, respectively, we got an inside peek at the styles about to hit it big in 2019. If the kitchen is on your renovation to-do list for the new year, here are some borrowed-from-Europe trends to know. “In Europe, matte is king,” says Calimano. Worktops, cabinets, countertops… leave the glossy finish behind in 2018 and opt instead for this cooler, more modern look. According to Bertazzoni, matte black, in particular, seems to be enjoying significant popularity: “The color is a neutral, but it offers a bolder design statement—it has more personality. Designers like it because it’s chic; it’s fashionable,” she explains. Merlin Wright is the design director of British bespoke kitchen manufacturer Plain English. He champions using natural materials for a practical reason, as well as an aesthetic one: “We want our cupboards to age well and last indefinitely, unlike plastics and sprayed finishes, which can deteriorate quickly and are hard to repair.” Whether it’s new countertops (try Cosentino’s Fossil variety from its Dekton Natural Collection) or even just adding wooden open shelving for some wall interest, we’re all for this easy-to-style trend. Feeling bold? Bertazzoni’s 4 Brass Burner Range in bright yellow from the Professional Series will make an instant statement piece for even the tiniest of kitchens. Though if you aren’t willing to take the plunge yet, try smaller appliances (like a toaster or blender) or even artwork to get your fix of vibrant color. How do these more daring trends play out in real life when set against the architectural features of an older kitchen, you might ask? Easy: Europeans embrace the eclectic juxtaposition and are all about mixing and matching the styles. “There’s a movement toward concrete-inspired materials with pops of bold colors, like red and green. More minimalistic cabinets with a contrasting countertop. Neutral walls with pops of copper and teal,” says Calimano. Great news for indecisive decorators: You really can have it all. In 2019, adopt a more carefree approach to design and allow yourself to try styles that might be a little unconventional. What’s old is new again, and while people might be steered toward a lighter decor scheme here in the U.S.—especially anyone in search of that breezy California cool aesthetic—Europe is all about darker woods. “One of the reasons darker woods became less popular is that they can make the space feel heavier,” says Bertazzoni. Now, the style feels fresh. Try open shelving instead of closed cabinetry; Bertazzoni says this balances out the darker tone and makes the kitchen feel larger. Or incorporate the antique style in a contemporary manner. Sleek cabinets and minimalist silhouettes contrast the heavier shade. In lieu of a kitchen island, try a worktable. “Unlike a fixed island, they have distinct legs and visible space below them, so they create a much lighter feel to a room—especially smaller ones—than cupboards, which are fitted to the floor,” says Wright. If you’re renting, you, in particular, might be interested in this temporary, storage-adding solution. Worktables are also a more budget-friendly way to update your kitchen; we love the Brooklyn Kitchen Cart ($279) from Pottery Barn.